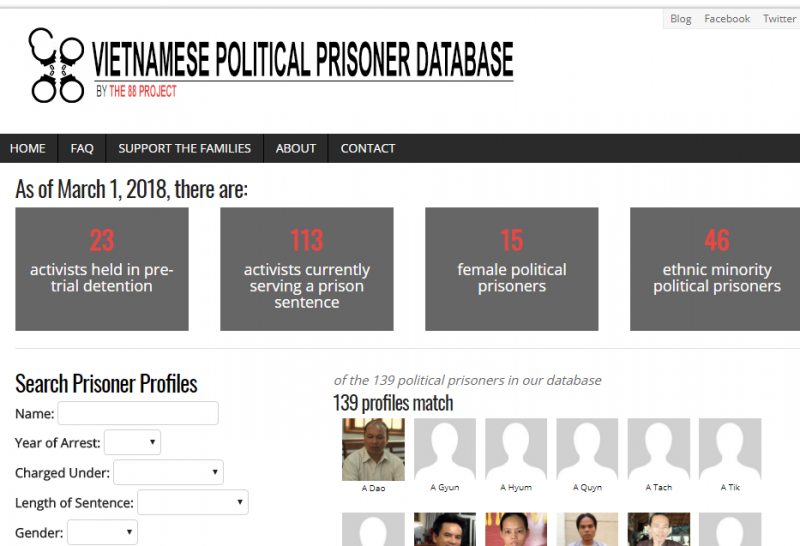 Launched in January 2018, the Vietnamese Political Prisoner Database provides comprehensive and routinely updated information on the country’s political prisoners. Built by 88 Project, a group that works to extend assistance to political prisoners and their families, the website currently lists 113 activists who are in detention, 23 of whom are facing pre-trial investigation. The website is updated each week, allowing researchers, journalists, policymakers, activists, and others who want to study or support the cause of the prisoners to regularly check on their statuses. Unlike mainstream news reports, which typically mention the political affiliation of prisoners and not much else, the database includes the gender and ethnic profile of individuals. 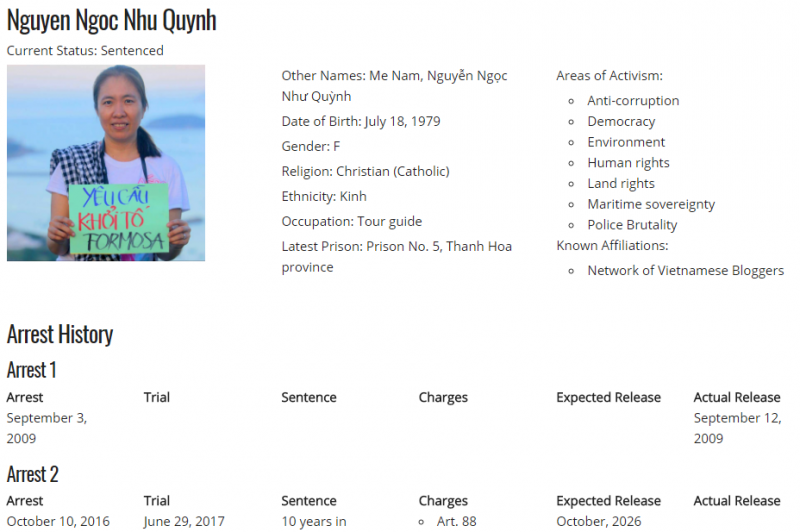 According to the database, Vietnam has 15 female political prisoners and 46 who belong to an ethnic minority group. The site currently shows that 49 individuals are facing a prison term of more than 10 years, 33 are Christians, 43 were arrested in 2017, and 83 have cases related to promoting religious freedom. In sum, this data supports a common sentiment, seen in news reports and on social media that persecution of dissenters increased in 2017, as did the proportion of harsh prison sentences handed out to writers and peaceful activists. The database also confirmed the high number of individuals charged with the notorious article 88 of the criminal code or the crime of conducting “anti-state propaganda”. The profile of detained individuals contains complete information about their activism, case history, situation inside the prison facility, and campaign activities pushing for their release. 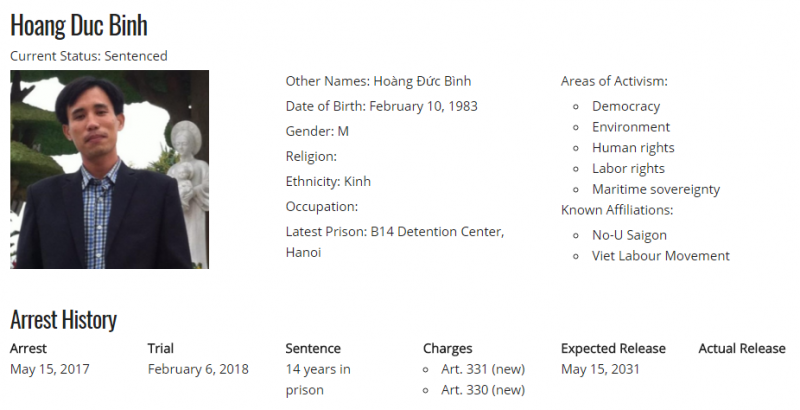 For example, here’s the profile of Hoang Duc Binh who was arrested for livestreaming a demonstration about environmental protection in 2017. He was charged with violating article 330 or “abusing democratic freedoms to infringe upon the interests of the State.” He was convicted last month and sentenced to 14 years in prison. Binh received one of the harshest prison terms for a known prisoner at this time. At trial, he affirmed that he made comments about police brutality during the livestream, but he also maintained that this was not a criminal act because it was the truth. The database also sheds light on the impact of the incarceration of activists and writers on their families by providing information about the current situation of their families. Indeed, one of the objectives of setting up the database is to facilitate support for the families of political prisoners. Quynh’s mother, Nguyen Thi Tuyet Lan, is now caring for Quynh’s two young children. Lan has been followed and harassed by authorities since her daughter's arrest. The leaders of 88 Project have vowed that funds generated will not be used for political campaigns, but mainly to give assistance to families of political prisoners.